In this post, I explain How to Create Nested WebGrid with Expand/Collapse in ASP.NET MVC. 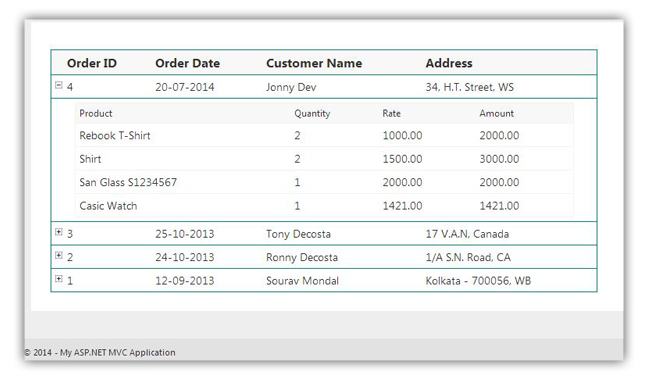 In one of my previous article, I have explained how to create master details entry form in asp.net MVC application, where we have seen how to save master-details data in our database like Order and order details information. But when we will save master details information, then we should have a way to show master details information on our web page right? So, here I have explained how to show master-details data in a webgrid in asp.net MVC application. Here we will create nested webgrid with expand/collapse features for showing master-details data. Step-5: Add a class for creating a view model.